A Hogan House was the name of the traditional semi-subterranean shelter or house style that was used by the Navajo Native Indian tribe. The Hogan was built to a specific, predetermined plan and were used as both a home and a center for religious ceremonies and rituals. The main timbers used to construct the Hogan were from the piñon pine tree that was native to Arizona, New Mexico, Utah, and Colorado where the Navoho tribe was located. Learn about the structure and the interior of the Hogan House with pictures and images together with interesting facts and information. Summary and Definition: The Hogan was a semi-subterranean dwelling that was dug from the earth built by the Navajo Tribe. A wooden domed mound was built over the top that was covered with earth, mud, sod (turf) and reeds or was occasionally made from stone. Hogans were roughly round, consisted of a single room without dividing walls and windows. The name Hogan derives from the Athapaskan (Navaho) word 'hoghan' or 'hooghan' meaning "dwelling, house." The Navaho people recognize two distinct classes of hogans called the 'keqai' meaning the winter place, and the 'kejin' meaning the summer place which were more makeshift constructions. The Hogan was not only the home of the Navajo but also the center of religious ceremonies and rituals. Why was the Hogan built as a Navajo shelter or house style? Every tribe choose a type of housing to suit their lifestyle, the climate, the environment and the natural resources (known as biomes) that were available to them, and the Navajo tribe were no different. The Hogan was chosen as the most suitable type of house because it suited the lifestyle of the Navajo tribe who lived in the southwest desert regions in the states of Arizona, New Mexico, Utah, and Colorado. The Navajo people were skilled builders and made good use of the piñon tree found in their habitat and used to make the timber framework of the Hogan style house. The Navajo tribe used timber from the piñon pine tree (Pinus edulis) to construct a hogan. The piñon pine tree grew to a height of 33 - 66 (10–20 metres) tall and its trunk had a diameter of up to 31 inches (80 centimetres). Five principal timbers were carefully selected to make the house frame. There was no standard size for the completed Hogan, but commonly piñon trees but trees of about 10 - 12 feet long with diameters of 8 to 10 inches were selected. Three of the five timbers were used to terminate in spreading forks. The other two timbers were selected for their straightness and used for the frame for the Hogan doorway. When suitable trees were found they were cut down, trimmed of branches, stripped of bark, and dragged to the site selected to build the Hogan, often some distance away. There were two types, or styles, of Hogan. 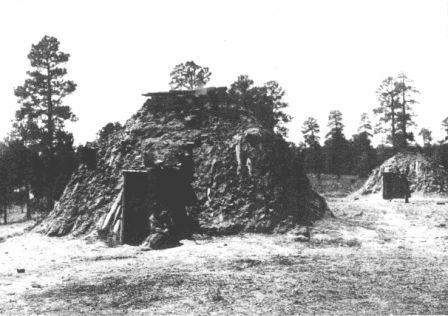 The ancient Hogan was known as the "forked stick hogan" was the conical, tepee shaped house constructed of three forked poles covered with logs, brush and mud called the "male" hogan by the Navajos. The later Hogans were circular, 6 sided dwellings constructed of logs or stone called the round or "female" Hogan. The Hogan was used for various religious rituals and ceremonies and there were many traditions and customs related to the building and occupation of the Hogan. A recess was made on the western side of the Hogan, called the "mask recess", where the shaman or medicine-man would store his masks and fetishes. The offset thus formed is called the "mask recess”. The Navajo believed that Yei spirits could be summoned by masked dancers who were called the Yei-Bi-Chi. The smoke hole not only let out the smoke and let in light and air but also allowed the spirits to come and go through this "Spirit Hole"
How was a Hogan built? Hogans consisted of a single room without dividing walls and a central fire pit. There were no windows. The Round Hogan interior included a central fire pit within a central communal area, located between the four main vertical posts. The communal area was used for preparing and cooking food and also as a meeting place. The west wall, opposite the eastern entrance doorway, contained the sacred area called the "mask recess". Beds, consisting of dried grasses covered with animal hides, were located on the floor, or on the built in ledges. The early hogan contained no decorations and very little furniture. There was a grinding stone and cooking utensils. Hogans were kept cool by natural air ventilation and water sprinkled on the dirt ground inside.